Target is now offering a debit card for TCOE. Have a Target REDcard? Are you signed up for Take Charge of Education? 1% of your purchase goes to Teach! That means if you are buying toilet paper, armor all, baby socks, video games, potting soil, sheets, jewelry, soap, sporting goods, milk, sweaters, furniture, toys...1% of all that will go directly to Teach. Go to the super secret link to find out about the benefits of the program and enroll your school or apply for a RED credit or debit card. I'm not sure why, but the link that Target provides does not now work, nor has it ever worked to take you to the page you need. There is no link at Target.com, and there's no search results that come up. This is the link: https://www-secure.target.com/redcard/tcoe/home. You can find it any time with Google, no problem. If you already have a REDcard, you can go here to sign up Teach (or any other school you like) to receive the 1% of your purchases. If you don't have a REDcard, but would like to get one, you can apply here. You can apply for the debit card at the store, in line, by paying with a check. It's easy! Idona called the meeting to order at 8:30 a.m.
As the regular secretary was unable to attend February's meeting, Mignon Jones took minutes last month. She provided Idona with a written meeting summary that was read aloud to the group today. There were no questions regarding the minutes. Summer Kabaker motioned to approve them and Randi Barros seconded the motion. The minutes were approved. Marie Neumann distributed an updated Profit & Loss statement. She told the group that there is currently about $6,700 left to collect. Anything that remains uncollected will come out of the current booster balance of $77K. There is also approximately $29K still to be paid out from that balance to cover costs associated with the recent 5th grade trip to Yosemite. Marie reported that to date, approximately 25% of the booster reserves have gone to pay for 2012-13 study trips. The group discussed the fact that we need to work hard to align income versus expenses; we cannot continue to spend more money than is coming in through family contributions and fundraising. In the coming months we will need to reevaluate the study trips and determine if we need to substitute more cost-effective options for any of them. There was further discussion regarding funds raised for the upcoming March-a-thon (scheduled for April 5). We currently have about $800-900 in t-shirt sponsor commitments; at this point last year, we had approximately three times as much raised through t-shirt sponsorships. There was a question regarding the willingness of boosters to take sponsorship from individual families; it was confirmed that these kinds of sponsorships would indeed be welcomed. There was additional discussion regarding charter schools' approach to fundraising and how that differs from ours. Marie also said that the bookkeeper we've contracted has some ideas regarding collection of funds; Marie hopes that the bookkeeper will be able to attend a future meeting with the teachers to discuss these ideas and budgeting priorities. At this point, Doris Kim suggested tying fundraising efforts to specific grades and using visual markers (eg, a drawing of a thermometer) to keep track of each grade's efforts. The group was encouraged by this idea as something in compliance with AB1575 that would also tie specific goals to specific fundraising and would help parents and kids understand the very real necessity of earning enough money in advance of it being spent. A. March-a-Thon: There will be a kickoff assembly on March 15. On that day, packets will be sent home for fundraising. All fundraising will be collected as flat donations in advance of the event (no lap counting), so the event date will also be the deadline for collecting and turning in funds. This translates into three weeks for outreach by students and families. Randi Barros, Marie Neumann, Idona Cabrinha, Kurt Rightmyer, and Doris Kim offered to help with counting the funds collected. Kate Poeschl said that Charlotte Rinaldi was also willing to help. The group decided that one final notice re sponsorship opportunities should be sent out early next week, as the firm deadline for t-shirt design is next Friday. B. Short-term Traffic Solutions: Brigetta Walsh is spearheading a supervised walk/bike to school from Broad and Lincoln streets (called the "Walking School Bus"). More information will be coming out soon. Individuals in attendance then offered a couple of other possible ideas, including closing Jaycee to residents and handicapped only for a single day to encourage parents to think of other options for drop-off and pick-up. It seemed to be the group's consensus that this would be difficult to communicate in advance and enforce and would likely prove problematic more than helpful. Another idea included an additional crossing guard at Grant/Highland. C. Nominating for Next Year's Board: Idona encouraged people to consider booster board positions for next year. We need to put together a slate of board members and vote on them in the next couple of months; we also need to recruit individuals for chair positions. Helen Sipsas spoke about her interest in serving on the board next year. It will be an important year with regard to school board communication/lobbying and the uncertainty of Teach's future. D. Yearbook Update: The yearbook is progressing and they've completed buddy pics and ad sales. Mr. Block reported that the Yosemite trip was a "phenomenal experience" for all involved. He said that the quality of instruction was great. The accommodations included Wawona this year because of the virus issue and cabin closures. He stressed that where you go isn't as important as the curriculum and experience, and the teachers and staff were able to make this an incredible experience despite the location changes. Vanessa Rizzo asked about rumors related to changing future trips, and there was extensive discussion regarding the need to balance expenses with fundraising. Mr. Block stressed that nothing has been decided regarding future trips; that said, it is likely that there will have to be discussion and decision-making to balance money in versus money out. Those who have attended the "traditional" Teach trips in recent years spoke to the quality of each and the desire to keep them going. Others brought up alternate opportunities to explore, including Vandenberg, Rancho El Chorro, Montana de Oro, the Botanical Gardens, local abalone farms and Camp Ocean Pines. Robin O'Leary described the recent day trip to the Cal Poly labs and described how impressed she was with this effort. Helen Sipsas mentioned that we may want to evaluate non-profit fundraising models and how they break down giving options. There was additional discussion with regard to fundraising and possible efforts (eg, tiles, bricks for a wall) as well as recognizing givers. It would also be wise to tap into the alumni network that was willing to jump in and speak to the value of Teach during recent months. Marco Rizzo offered to have his brother, who is a lawyer, draft language for fundraising goals so that we stay within the guidelines of AB1575. There was additional discussion of the idea of grade-specific fundraisers and of holding the trips AFTER monies have been raised. Using visuals like the thermometer might help light a fire under families and help them realize that trips won't happen if the funds aren't in place beforehand. Robin O'Leary stressed that spring can be a good time for the overnight trips for a variety of reasons, including health of the kids and behavior issues. Mr. Block also talked about how conferences are coming up next week. Open House was last week, and 25 potential 4th grade families signed in. Kate Poeschl asked how this differed from last year. Mr. Block said that it is hard to compare, because an invitation didn't go out to potential 5th and 6th graders, as it did last year. Kate then asked how we might draw in and embrace those kids who don't have parent advocates. Because the school board specifically mentioned this kind of student at the last meeting, this could be important in terms of growing the program and improving our P.R. The group discussed whether there could be outreach across the district throughout conference week. Vanessa Rizzo asked if parent reps could attend other schools' open houses, but there were a couple of objections to this (eg, timing, plus the focus of those open houses). Idona stressed that parent to parent communication is perhaps the most important and successful, and the group discussed possible outreach to ELAC groups. There was consensus that when the program is successful, it grows and sells itself. In addition, someone proposed that a Teach parent rep (or more) attend each school board meeting in the coming months. Mr. Block also discussed the district budget and the fact that layoff notices affected the BP/Teach campus as well as others in the district. He discussed upcoming STAR testing and an online pilot program to try a different test format. Ann Keller, who was a visiting alumni parent, said that it is interesting that the school board is trying to make up millions in budget shortfall through layoffs of counselors and librarians, whose salaries can't make up that much of the budget picture. A. Creeky Tiki Event: The rescheduled event will be held on April 20. Central Coast Gymnastics is hosting a Kids' Night Out that evening and will be donating the funds paid for child care to Teach. Volunteers are working to put together a really nice evening and we hope that now, more than ever, parents will attend and help support the school. We need everyone to be part of this major fundraising effort! B. International Day: Idona said that Int'l Day is Friday, April 26 and that the school has a collection of flags that can be displayed for the day. She said to contact her if you want to help get them out and put them up, and several people offered to help. 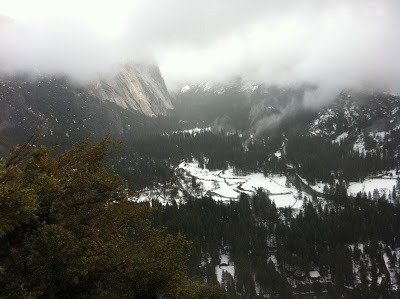 C. Booster Reps: There were no booster reps present to report, and the Yosemite trip -- the recent highlight of 5th grade -- was covered during Mr. Block's report. Idona highlighted the presentation of classrooms at Open House and said that things looked really nice. She then announced that she still welcomes any parents interested in attending Dr. Prater's monthly meetings of parent organization reps. Robin O'Leary has agreed to attend the next meeting. Kurt Rightmyer then motioned to adjourn the meeting and Summer Kabaker seconded the motion. 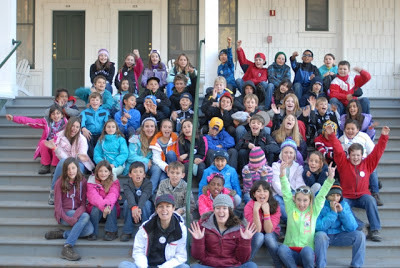 The meeting was adjourned at 10:00 a.m.
Our 5th graders enjoyed another great field trip to Yosemite Institute. YI gives students a chance to learn on site outdoors in one of Earth's most dramatic and beautiful landscapes. 5th graders explore the geologic history of the Sierra Nevada, engage in field research projects and discover how the environment supported humans from the early Miwok to the present. Teach students are able to attend this week-long camp thanks to generous parents and fundraising contributors. Thank you! !